I love Autumn/ Winter fashion, I hate being cold but I love coats and jackets paired up with dresses and thick tights! I can't wait till payday as there's so many things I want to buy! This weekend (11th & 12th October ) at Intu Merry Hill is all about Autumn/ Winter. Head on down for some amazing fashion shows and exclusive offers and discounts! I'm working over the weekend so I won't be able to attend which i'm so gutted about as I know the fashion shows will be amazing! I love seeing what the high street stores have to offer. I will be heading to Intu Merry Hill next week to have a little look around the shops, here's a few things that i'm loving right now! Black Opium is a new perfume from YSL which i'm currently in love with! It's such an amazing scent, it's warm and luxurious. This weekend The Fragrance Shop are offering £5 off a £30 spend which is a fabulous bargain, Christmas is around the corner so start your shopping this weekend and get yourself some bargains. This Oasis dress is amazing! It's new in for the Autumn/ Winter season. I'm loving the blue and yellow colours together and I would never normally go for a blue dress but this looks so good. I would wear this with tights and some big chunky boots like these ones from Clarks and a big chunky coat. 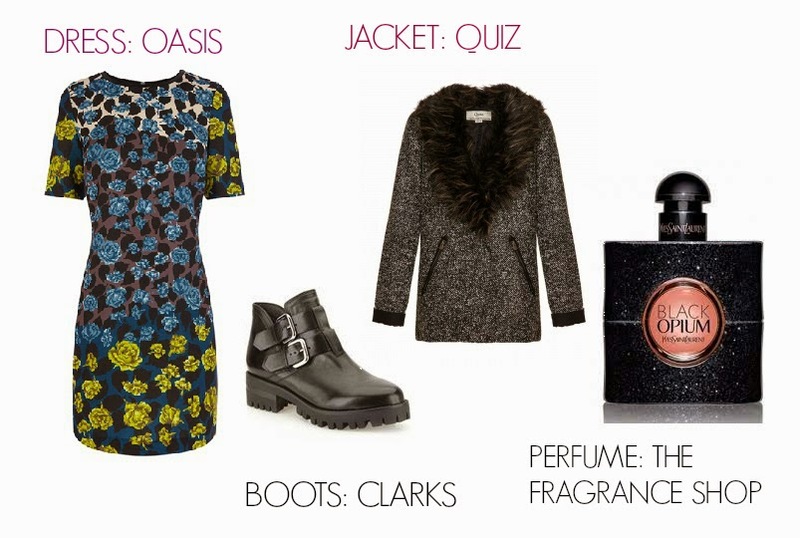 I love this one from Quiz as it's a classic style and you could wear it with so many outfits. The event is on this weekend at Intu Merry Hill, between 9am- 5pm. There will be loads going on so head down if your after some amazing Autumn/ Winter Fashion ideas and want some discount on top of that!